The March flower is Daffodil. Romans, who brought daffodils to Britain, believed the sap of the flower had healing powers and it is from Greek mythology that the word narcissus comes from. A nymph named Echo was in love with a young Greek named Narcissus but he ended their relationship. Heartbroken, Echo hid and died in a cave. The handsome, and somewhat egotistical, Narcissus saw his reflection in a pool of water and in an attempt to get a better look, fell in and drowned. The Greek myth says he then became the flower. Christians have adopted the daffodil as a symbol of Easter as it was believed that the flower first bloomed during the time of Christ’s Resurrection. The legend says it was in the Garden of Gethsemane during the actual time of The Last Supper which symbolized great sorrow and hope for much better things to follow. In Germany the flower is known as Ostergloken or ‘Easter bells’ and in England they are known as Lent Lillies where Prince Charles receives a single daffodil annually as a tradition. It is considered a rent payment for the unattended lands located in the Isles of Scilly. 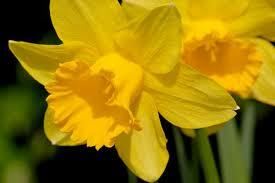 The daffodil is also a symbolic flower for Wales while the national emblem is the Leek. In Welsh ‘cenhinen’ is leek and daffodil is ‘cenhinen pedr’ or Peter’s leek. Over time both were confused which is why each have been known as the official flower of that country. The Druids saw that daffodils symbolized purity and accepted it as their national flower and Persians celebrate Nawruz (New Year’s) with daffodils. It is also a New Year’s decoration in China and Arabians used it as an aphrodisiac. Daffodil juice was used as a cure for baldness by Medieval Arabs and Egyptians used narcissus as a wreath to hang at funerals. It was believed that bad luck would occur if a single daffodil was taken into a home and the best way to avoid such misfortune was to give a full bouquet as a present and the household would be filled with good luck. The word daffodil can be traced back to the 1500’s replacing the original name of ‘affodyle’, which meant ‘that which comes early.’ The word ‘de affodil,’ a Dutch adaptation of the Greek myth of asphodel is where the origin of the flower name is said to come from. The asphodel flower, according to the Greek myth, was associated with death as the flower blossomed over the meadows where the souls of the dead were said to wander. 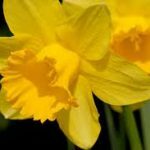 Want more information on the Daffodil?